Hope to see all the usual, and occasional, suspects there, and maybe even a few who'd like to be welcomed to the group for the first time. I'm in. If the 9th happens to be the one unsunny day in Evanston, we have space in my office, a 5-minute walk away, where we could sit and eat. You could meet my co-workers who think I make you guys up. Didn't you know? We are all just a figment of your imagination, Sharon. This usual suspect is planning to attend. As is this unusual suspect. Finally an ELG date I can make--and at one of my favorites and walking distance from my office. Looking forward to seeing you all! This sporadic suspect is interested, because like Evy I'm excited that this is the rare ELG date I can make. At least it looks that way now. Last edited by chapulin on June 2nd, 2009, 3:11 pm, edited 1 time in total. I'd like to be there too. All are welcome. As weather looks nice for Tuesday, we'll order at Al's, then retreat to the park next to the Noyes Cultural Center, across the street. See you there! I may be +1, depending on how many emergencies there are tonight. Aargh. Sorry for withdrawing in the (not quite) eleventh hour. No better reason than that the details of life are overwhelming me, and attending lunch means not attending to these. Have a good time, everybody. It looks unlikely that I'll be +1, and I'll be running a bit late, but I'll be there! 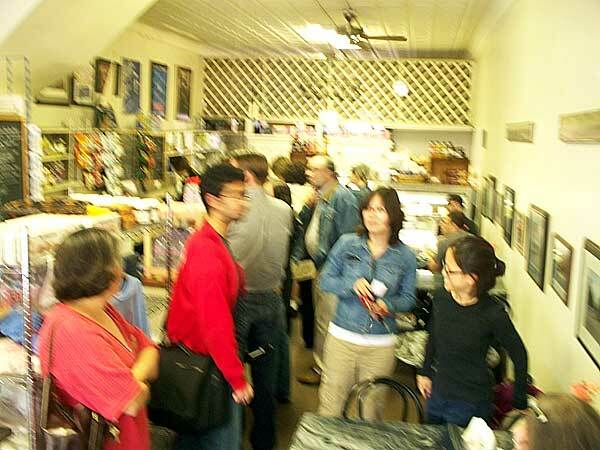 Cliché time: Great food, great venue, and most of all, great company for your Evanston Lunch Group™ at Al's Deli. The line at Al's wasn't bad for 12:30. 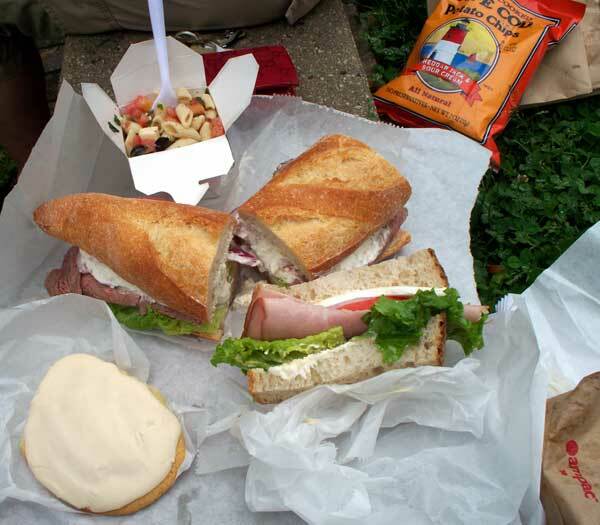 From top: Asiago Pasta Salad; nice chunks of asiago mixed in with the olives, tomatoes and vinagrette, Roast Beef with Blue Cheese Dressing on a crisp baguette; Smoked Ham with Brie on crusty whole wheat, and one of Al's trademark Frosted Sugar Cookies. We wandered across the street to Tallmadge Park - a nice venue, only slightly chilly, although the sun didn't show until after we were leaving. It was an especially good afternoon for me - I was able to unload some excess tomato seedlings. Still a few left. 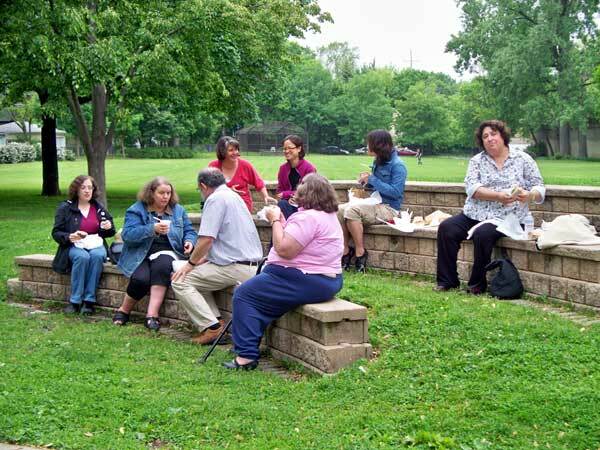 A good group for the first ELG™ picnic of the year, with plans for perhaps another one next month--we have to grab these summer days every chance we get! While the sunshine didn't cooperate fully today, Tom did arrange to have the Evanston parks crew come in to mow the grass while we were eating, adding that fresh-cut grass smell to our al fresco dining! My roast beef sandwich (above) was delicious, with enough blue cheese dressing to make drippage a good problem to have--I had been craving one for a while--and the sugar cookie was awesome, as was EvA's (German?) chocolate cookie. I'm also thrilled to have returned home with some adoptees--a jalapeno pepper plant and some mystery tomato plants (no clue as to variety)--from Tom's seedling orphanage. Thanks, Tom! Thanks, nr706, for arranging a very nice ELG outing, although you could've made sure the sun was shining for us. Al's sandwiches delicious as always. I always mean to try something else, but I can't stay away from the delightfully messy roast beef with blue cheese dressing. The German potato salad I had was excellent--not too sweet as it often is. My cookie, as noted by Tarte Tatin, was rich and chocolately. I think it was called a Belgian chocolate cookie, not German (wrong European country). Company was great as always. I was happy to relieve nr706 of some of his tomato seedlings. I've avowed to join this group for my 4 month rotation in Evanston and I finally made it! Thank you Tom for organizing this lunch. I thought the park was a nice spot to have lunch. Better place to talk as a group than the cramped table. I had a wonderful smoked ham/brie sandwich on an italian white with the aforementioned white bean soup. EvA wrote: Thanks, nr706, for arranging a very nice ELG outing, although you could've made sure the sun was shining for us. I've almost got the walking on water thing down; I'll try to get into controlling the weather after that. You just need us to believe more in you. A friend of mine had her three-year old say to her in the car: "Mommy, make it stop raining!"